The challenge was to create a web-based clinical decision support system (CDSS) that assists doctors in classifying pressure injury stages, stores patient information and shows their wound history. To meet the needs of our customer, our team developed a system which goes through all questions / statements pages to assess each wound, assign it a number and determine the diagnosis. Each wound number is shown on the body diagram. If doctors would like to reassess the existing wounds, they need simply to click on whichever wound number they want to assess and change or add information. As part of development process, we conducted a detailed research in order to adhere to international healthcare standards used for creating health industry software. Subsequently, we created a responsive design and developed an application which works on the latest versions of Firefox, Safari, Chrome, Edge or Internet Explorer 11 on Windows, OSX, Android and iOS devices. 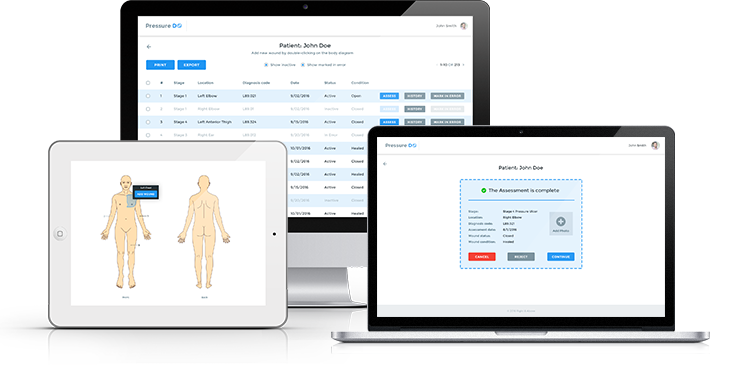 As a result, we successfully implemented an advanced application which helps clinicians do their job more effectively and in a highly organized way.